Karakuri ningyō (からくり人形) are mechanized puppets or automaton from Japan from the 17th century to 19th century. 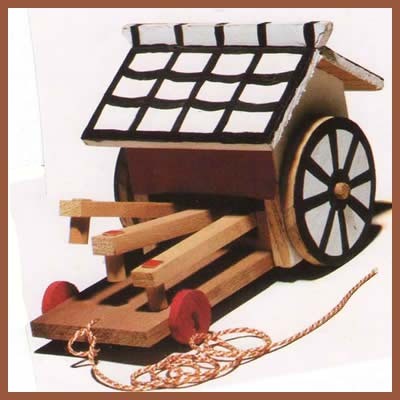 The word karakuri means "mechanisms" or "trick". In Japanese ningyō is written as two separate characters, meaning person and shape. It may be translated as puppet, but also by doll or effigy. The dolls' gestures provided a form of entertainment. Butai karakuri (舞台からくり, stage karakuri) were used in theatre. Dashi karakuri (山車からくり, festival car karakuri) were used in religious festivals, where the puppets were used to perform reenactments of traditional myths and legends, standing of festival floats (dashi). 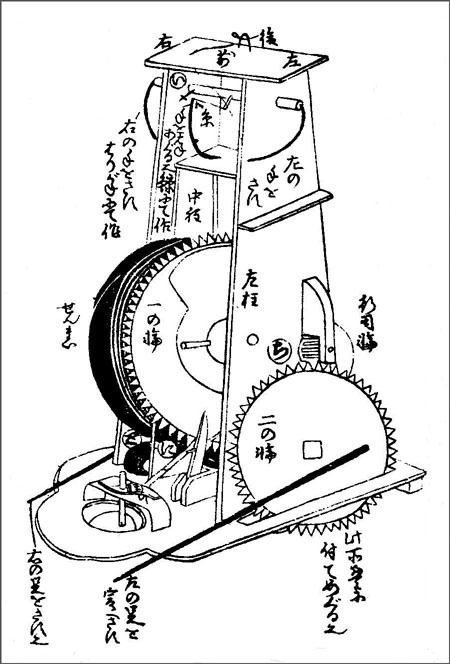 The inner mechanisms of KARAKURI dolls are illustrated in "KARAKURI-ZUI", a machine book of the Edo era. The lower left diagram is a whole view of a tea serving doll in the "KARAKURI-ZUI", and the right diagram is an inner view. The inside of a real doll seems to have been made with a wood, a thread, and a whisker of a whale (materials of a spring). 1 - A spring is wound up first, and then a doll is in the state that stands still. 2 - If a master puts a tea cup on the tray which the doll supports, the doll will begin to advance and the legs of the doll begins to move forward and backward. 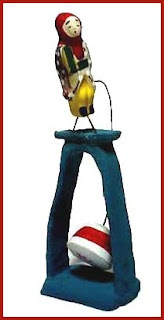 3 - If the doll comes in front of a visitor, the head of the doll will lean forward, that is, the doll bows. 4 - Then, if a visitor takes up a teacup, the doll will stop, and the leg motion will also stop. 5 - If a visitor drinks up tea and puts the teacup back on the tray again, the doll will rotate 180 degrees. 6 - Then, the doll stands with the head straight. 7 - The doll begins to advance toward the place where the master is, i.e., a starting point. The legs of the doll also move again forward and backward. 8 - If the doll comes back to the master and the master takes away an empty teacup from the tray, the doll will stop moving and the legs also. Born in Kurume, Kyushu. Later he opened a shop in Edo, 機巧堂(からくりどう Karakurido, and invented all kinds of useful things that people came to ask him for. 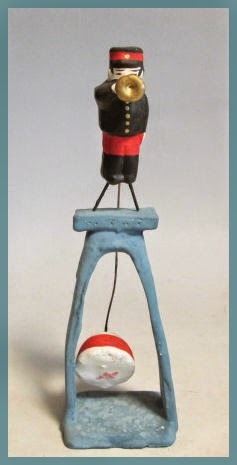 His "tea-serving doll" had a special stopping mechanism to stop right in front of the customer. a Japanese rangaku scholar, engineer and inventor during the Bakumatsu and early Meiji period in Japan. In 1875 he founded what became the Toshiba Corporation. He has been called the "Thomas Edison of Japan" or Karakuri Giemon. ..... While in Saga, Tanaka designed and built Japan’s first domestically made steam locomotive and steam warship. ..... After his death in 1881, his son founded Tanaka Engineering Works (田中製造所 Tanaka Seizōsho). The company changed its name after Tanaka’s death to Shibaura Engineering Works (芝浦製造所 Shibaura Seizōsho) in 1904, and after a merger in 1939 with Tokyo Denki became Tokyo Shibaura Denki, more commonly known today as Toshiba.
. Folk Toys from Okinawa .
. Trick Pictures of the Edo Time . Narai is an old postal town along the Nakasendo road and these monkeys were favorite souvenirs. 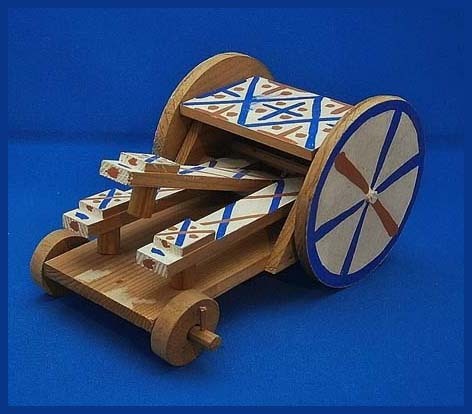 A wooden toy version of the important tool of rice farmers. The wheels turn around moving a mallet 杵. 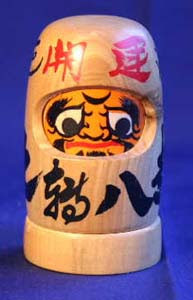 Another version is a simple toy where the child can move the mallet with its hands (te-oshiguruma 手押し車).
. WASHOKU - toys with food . katakata カタカタ when the toy is pulled.
. Tokushima town 徳島市 and Indigo . komekachiguruma コメカチグルマ in the local dialect. The character for rice (kome　米）is written as decoration. It has three mallets to move. This toy is not made any more in our modern times.
. Washoku - Food and Toys .
. . . CLICK here for Kobe Doll Photos !
. 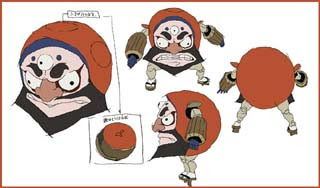 Kurama karakuri gangu　鞍馬のからくり玩具 mechanical dolls from Kurama .
. namazu osae 鯰押さえ subpressing a catfish . 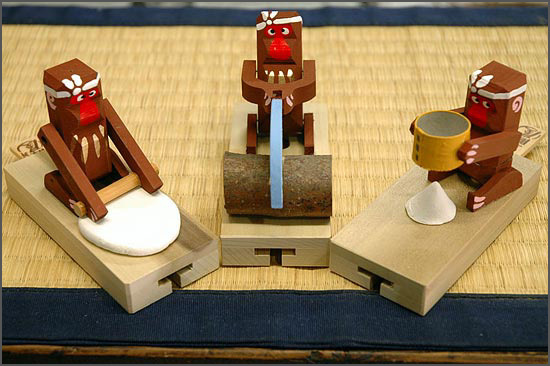 The head of the toys is made from clay, the robes from strong washi paper. These two also appear on the festival float of the Toshogu Shrine.
. Ushiwaka Minamoto no Yoshitsune 源の義経 (1159 - 1189) . ... This was during the period (1730-1739) when Tokugawa Muneharu was in power as the head of the Owari clan. Muneharu's policy of supporting festivals and other spectacles thus fostered the first Tamaya Shobei. The vigor of Karakuri parade float culture in Nagoya and the surrounding area has nurtured and sustained the Tamaya Shobei family for nine generations. They are the only Karakuri doll maker household of their kind in Japan.
. Tokugawa Muneharu 徳川宗春 (1696 - 1764) . Osaka has produced quite a few humorous dolls. 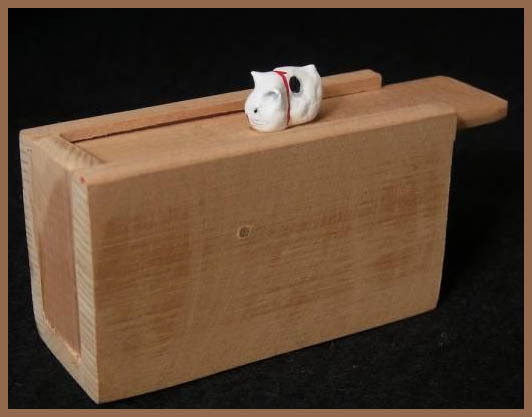 A clay cat is sitting on the wooden box. If you pull the lid of the box, it opens and a clay mouse comes out. If you now push the lid toward the mouse, the mouse hides again in the box.
. Ootsu Matsuri 大津祭 Otsu festival,Otsu matsuri . The Takayama fall festival is one of the three largest festivals in Japan. The festivals are famous for the large ornate floats, or yatai, which roam around the city at night. 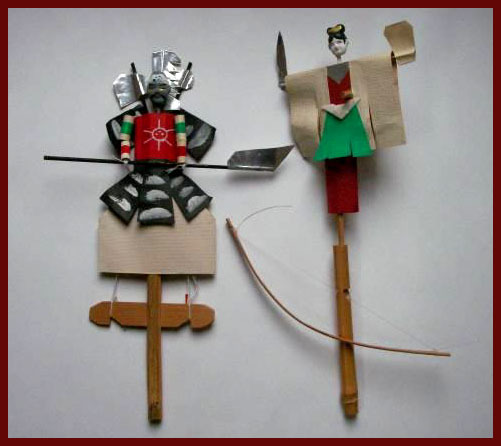 The puppets or marionettes are made of wood, silk and brocade or embroidered cloth. They are operated by strings and push rods from within the yatai. “Karakuri (mechanical) puppet plays performed on a stage are superb”. 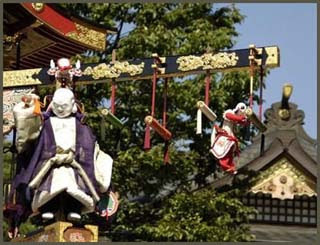 The puppets like the Yatai represent the skilled craftsmen of the area. 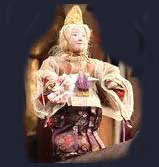 The puppets or The three marionettes “on Hotei Tai (the god of fortune)” require 9 puppet masters to manipulate the 36 strings which make the marionettes move in a lifelike manner, with gestures, turns and other movements. A problem with the puppets are parts needed to repair the puppets. The springs in the puppets are made of Right whale baleen and cannot be replaced with steel springs or the baleen of other whales. Other materials used to make the springs cannot duplicate the movements of the springs made with Right whale baleen.
. Ema 絵馬　votive tablets .
. Teri-furi ningyoo 照り降り人形 "weather forecasting dolls" . Ema from the Toshogu shrine, this time with the parade of floats with mechanical dolls. They stand on an arched pedestal, with their feel on two metal sticks in the frame. The back is attached to a weight with another metal wire. So they can move back and forth. They were popular around 1888, for example the soldier blowing a trumpet.
. 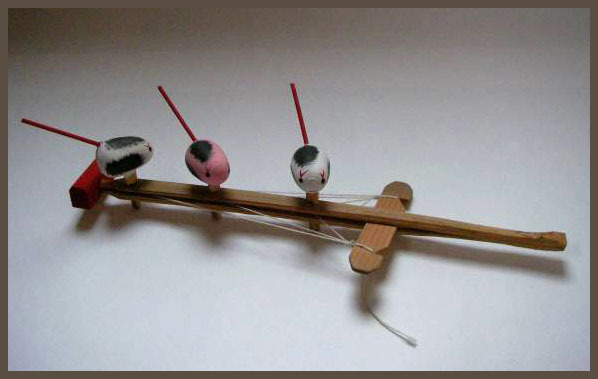 Folk Toys from Kagawa - Takamatsu . Karakuri dolls were the first automata in Japan. even a set to "do it yourself"
. 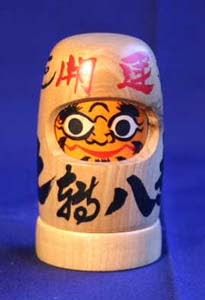 Shuten-dōji. 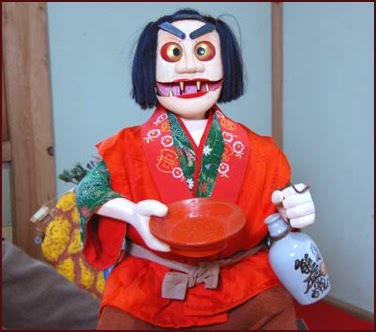 Shuten Doji 酒呑童子 a Sake Yokai Monster . 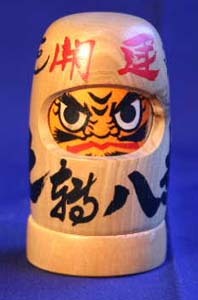 After the gentle doll face has drunk one sip of sake, the face changes to the oni demon mask. There was a "Doll Street" in Edo, where the mechanical dolls were sold. 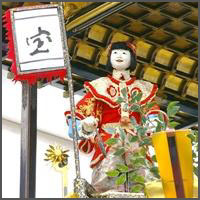 This hokku is from the 9th month (October) of 1818, when Issa was traveling near his hometown.
. Chris Drake - Kobayashi Issa .
. Ayatsuri ningyoo 操り人形 marionette . I love the tea serving robot! He's splendid! Japanese "Karakuri Ningyō" automata, with subtitles -- The most famous Japanese "Karakuri" automata that have made 200 years ago. The "Karakuri" automata is the traditional handcraft of Edo period(1603-1868). Their movements are caused by the power of springs. Japan boasts to the world the ultimate reproduction of "Karakuri" automata. 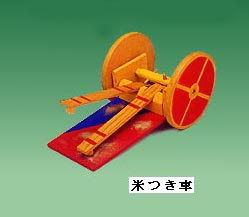 The "Karakuri" automata that bend arrow has been achieved by Hisasige Tanaka, the first president of Toshiba. Published on Aug 26, 2012.